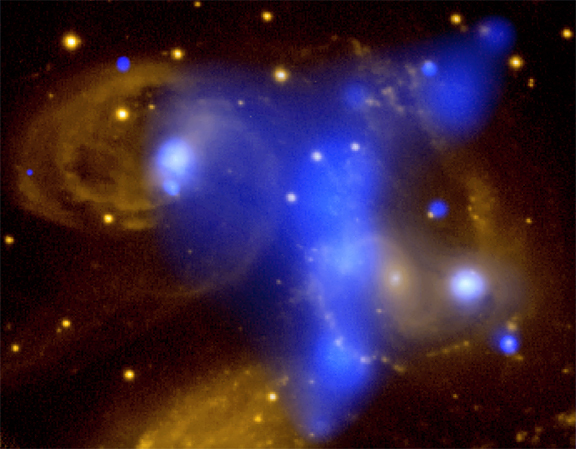 The hurly-burly interactions in the compact group of galaxies known as Stephan's Quintet show the Chandra X-ray Observatory image (blue) superimposed on a Digitized Sky Survey optical image (yellow). 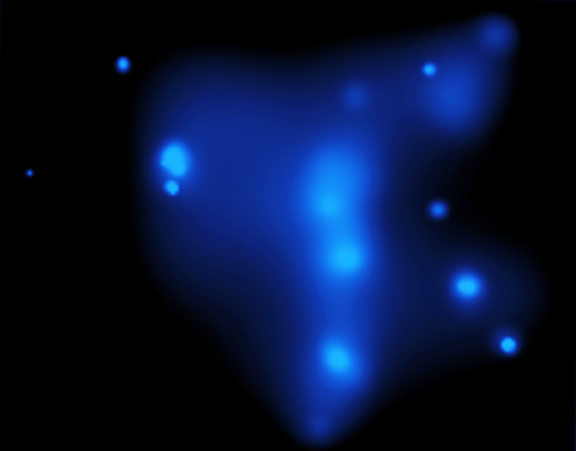 Shock-heated gas, visible only with an X-ray telescope, appears as a bright blue cloud oriented vertically in the middle of the image and has a temperature of about 6 million degrees Celsius. The heating is produced by the rapid motion of a spiral galaxy intruder located immediately to the right of the shock wave in the center of the image. The shock-heated gas in Chandra's X-ray image of Stephan's Quintet has a temperature of about 6 million degrees Celsius. The heating is produced by the rapid motion of a spiral galaxy intruder located immediately to the right of the shock wave in the center of the image. 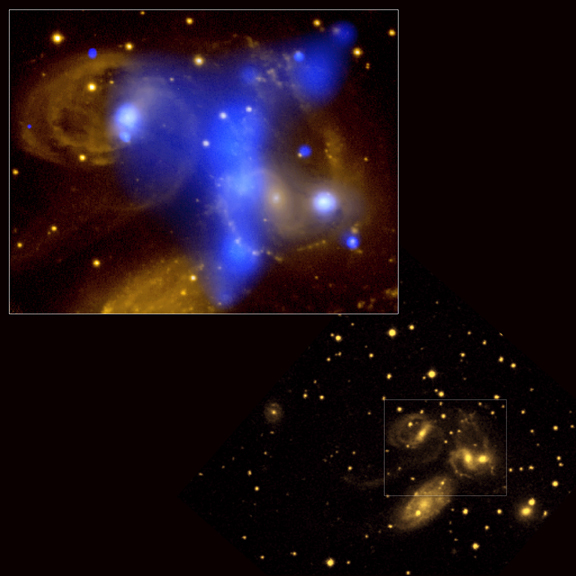 The hurly-burly interactions in the compact group of galaxies known as Stephan's Quintet are shown in the upper left where a Chandra X-ray Observatory image (blue) is superimposed on a Digitized Sky Survey optical image (yellow). Shock-heated gas, visible only with an X-ray telescope, appears as a bright blue cloud oriented vertically in the middle of the image and has a temperature of about 6 million degrees Celsius. The heating is produced by the rapid motion of a spiral galaxy intruder located immediately to the right of the shock wave in the center of the image. 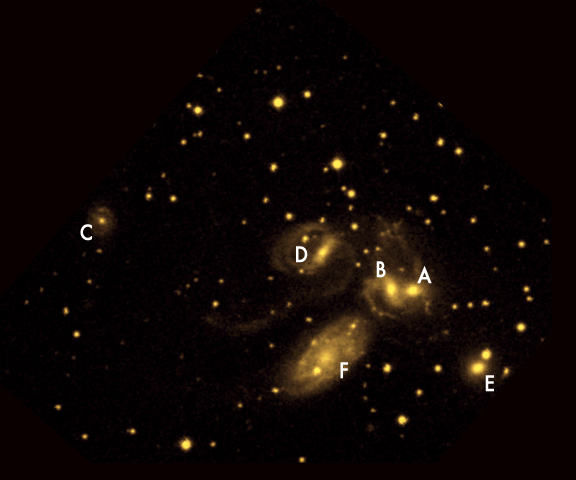 The four galaxies A, B, D and E in this wide field optical image are at a distance of about 280 million light years from Earth. 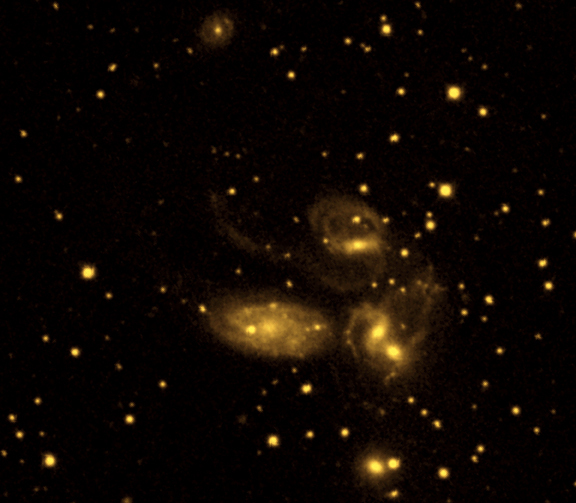 The large-appearing galaxy F in the lower left of this image has now been identified as a foreground galaxy at a distance of about 35 million light years, leaving the group originally identified as Stephan's Quintet with only a quartet of galaxies. However, if we include galaxy C, which is at the same distance as the other four galaxies, it becomes a quintet again! The four galaxies in this wide field optical image are at a distance of about 280 million light years from Earth. The large-appearing galaxy in the lower left of this image has now been identified as a foreground galaxy at a distance of about 35 million light years, leaving the group originally identified as Stephan's Quintet with only a quartet of galaxies. However, if we include the galaxy at the top edge of the image, which is at the same distance as the other four galaxies, it becomes a quintet again!